I adore Italian pies and tarts: they might look humble, but when you take that first bite, you remember why you like them. While the same kind of Finnish pies/cakes taste usually dry and sandy, the Italian counterparts are usually moist and so delicious that I always get surprised when I taste one (like on our last trip to Italy). 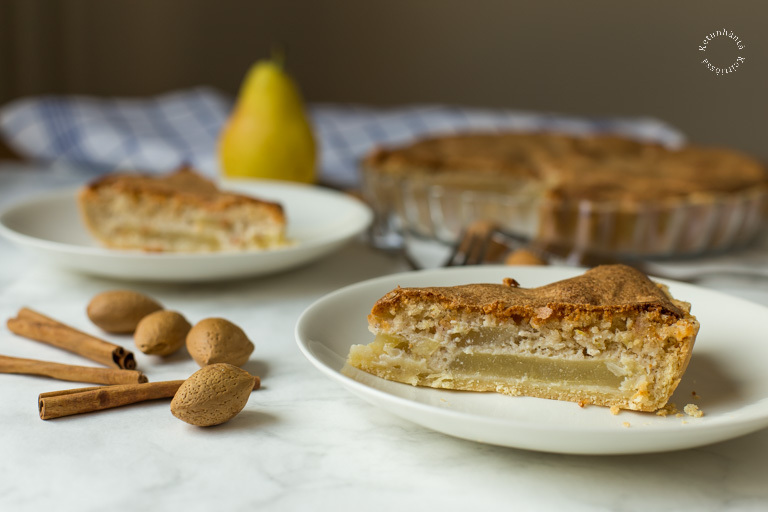 Many many years ago I tasted a very delicious pear pie with some kind of moist dough on top of the pears and ever since I've been on the lookout for the recipe. 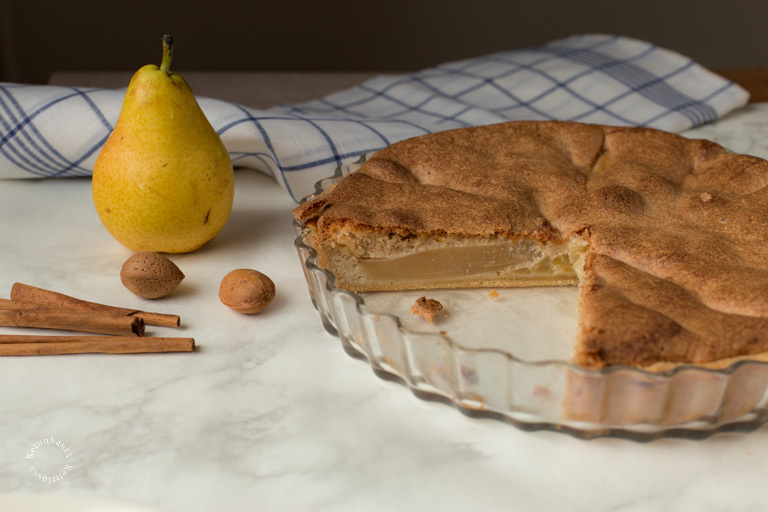 When I encountered a recipe for Barchiglia, an Italian pear & almond pie, usually made with marmellata di pere (pear preserve) and an almond filling with a chocolate glaze on top, I immediately remembered that lovely pear pie and that the almond filling might be the answer to get that crumbly but at the same time moist, cake-y layer. Unfortunately it wasn't. But it was still one of those delicious Italian (kind of) tarts. 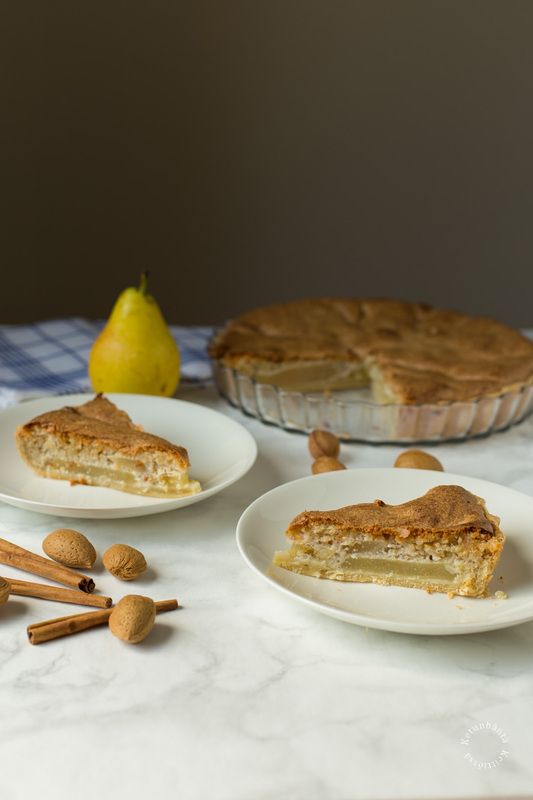 I say "kind of" because this is my version on the Italian tart: I substituted fresh pears for preserved and skipped the whole chocolate glaze. Maybe Italians now find the recipe wrong (like what happened here!) so I'm not going to call it Barchiglia but just pear & almond tart. I first thought of calling it frangipane pear tart without the full knowledge of what frangipane is. 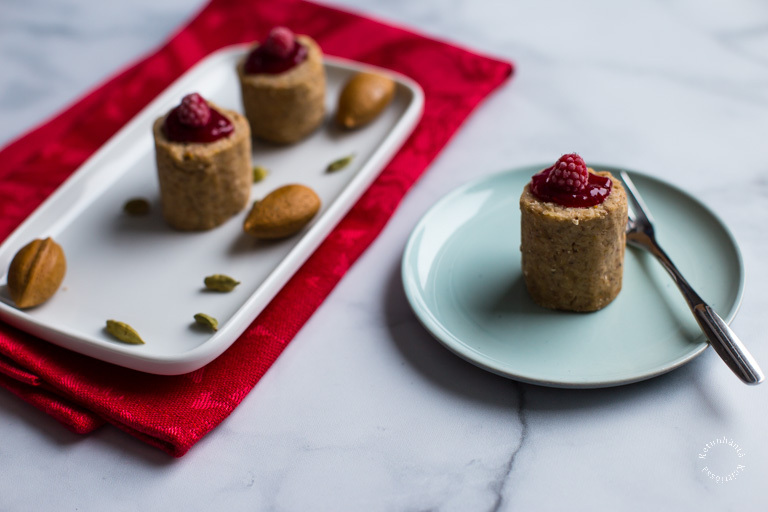 Despite the almond filling has basically the same ingredients as frangipane (except the butter), it's fluffier because egg yolks and whites are whipped separately. 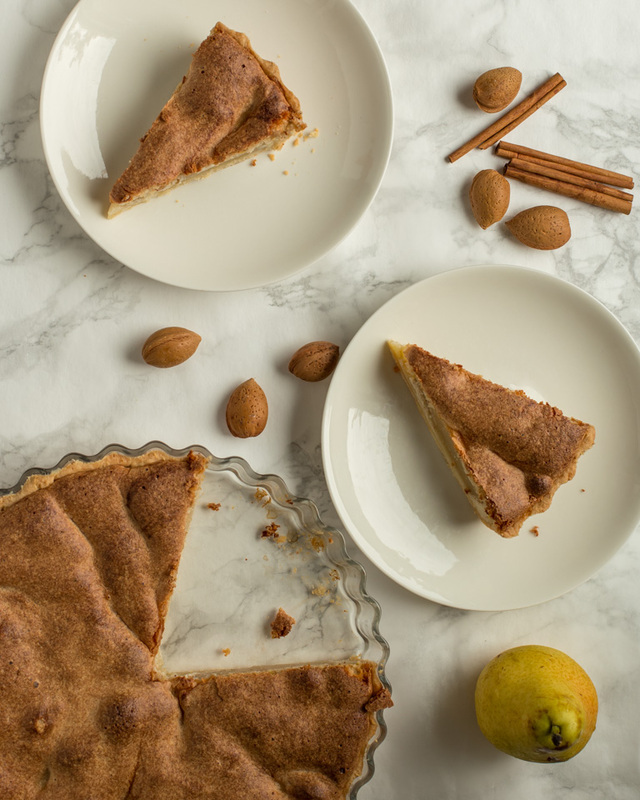 Now I'm actually thinking that frangipane might be the answer to that pear tart recipe I've been longing for (next time I might try this pie with frangipane topping then). P.S. Toddybear is growing so fast! If you want to see how he's doing, I'm posting photos and videos of him quite regularly to my Insta. He is such a sweet pup! My version on the Italian pie Barchiglia: I used fresh pears instead of pear preserve. The original Barchiglia has a chocolate topping, so if you want, top the pie with melted dark chocolate or a chocolate sauce. Prepare the crust: mix the flour, sugar and salt with cold butter by pinching with fingertips until it resembles wet sand. Add the water and mix it quickly together. Add more water if needed. Place the dough in plastic wrap and let it cool in freezer for 15-30 minutes or 1 hour in fridge (don't overchill it as then the dough will tear apart while rolling it. If you cooled the dough longer, let it warm up about 15-30 min in room-temperature). Roll out the dough into a round disc (appr. 3-4 mm in thickness) and line a slightly oiled 25-28 cm pie tin with it. (Don't oil the sides, only the bottom). Peel and core the pears. Slice each into 6-8 wedges. Put the pears with lemon juice, 1 Tbsp sugar and water to a pot, cover with a lid and bring to boil. Cook on medium heat for about 5 minutes or until the pears are slightly softened but still firm. Let them cool a bit while you prepare the frangipane filling. Separate the eggs. Whip the eggwhites until soft peak stage. Whisk the yolks with sugar until fluffy. Stir in the cinnamon and lemon zest. Add the almond meal. The mixture will be very thick! Gently fold in the whipped eggwhites in three parts. Arrange the pear slices on the crust. Pour the frangipane filling on top. Bake in 175 C oven (155-160 C in convection oven) for 45-50 minutes. Let the tart cool for a couple of hours before serving. Adapted from Rosetta Costantino: Southern Italian Desserts.